Blood Type is the classification of blood based on the presence or absence of two antigens on the surface of the Red Blood Cell (RBC). An antigen is any substance that causes the immune system to produce antibodies against it. The blood type of a person is genetic. It is inherited from the blood type of the parents. 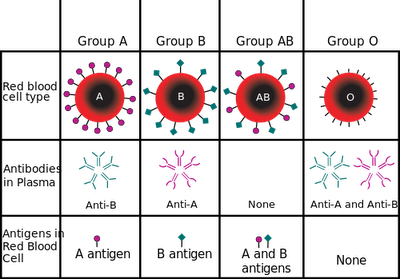 Blood is grouped according to the ABO blood typing system. This is based on the A antigen and the B antigen. There is also a third antigen which is the Rh factor. It also can be present or absent from the blood. If it is present, the blood type is positive (+). If the Rh factor is absent, the blood type is negative (-) Rh negative blood is given to Rh-negative patients, and Rh positive blood or Rh negative blood may be given to Rh positive patients. People with blood type A, B, or AB had a higher risk for coronary heart disease when compared to those with blood type O, according to new research published in Arteriosclerosis, Thrombosis and Vascular Biology, an American Heart Association journal. People in this study with the rarest blood type — AB, found in about 7 percent of the U.S. population — had the highest increased heart disease risk at 23 percent. Those with type B had an 11 percent increased risk, and those with type A had a 5 percent increased risk. About 43 percent of Americans have type O blood. "While people cannot change their blood type, our findings may help physicians better understand who is at risk for developing heart disease," said Lu Qi, M.D., Ph.D., the study's senior author and an assistant professor in the Department of Nutrition at the Harvard School of Public Health in Boston. Knowing your blood type can be an important part of staying healthy and avoiding heart disease, Qi said. "It's good to know your blood type the same way you should know your cholesterol or blood pressure numbers," he said. "If you know you're at higher risk, you can reduce the risk by adopting a healthier lifestyle, such as eating right, exercising and not smoking." The findings are based on an analysis of two large, well-known U.S. studies — 62,073 women from the Nurses' Health Study and 27,428 adults from the Health Professionals Follow-up Study. Participants were between ages 30 and 75, and both groups were followed for 20 years or more. Researchers also considered the study participants' diet, age, body mass index, gender, race, smoking status, menopause status and medical history. Researchers noted that the percentages of different blood types seen among the men and women enrolled in the two studies reflected levels seen in the general population. The study did not evaluate the biological processes behind blood type and heart disease risk. "Blood type is very complicated, so there could be multiple mechanisms at play," Qi said. However, there is evidence suggesting that type A is associated with higher levels of low-density lipoprotein cholesterol, the waxy substance that can clog arteries, and type AB is linked to inflammation, which may affect the function of the blood vessels. Also, a substance that plays a favorable role in blood flow and clotting may be higher in people with type O blood. Understanding blood type could help healthcare providers better tailor treatments, Qi suggested. For example, a patient with type A blood may best lower heart disease risk by decreasing cholesterol intake. The study group was predominantly Caucasian, and it's not clear whether these findings would translate to other ethnic groups. Environment also contributes to risk, Qi said. "It would be interesting to study whether people with different blood types respond differently to lifestyle intervention, such as diet," Qi said, noting that further analysis is needed.